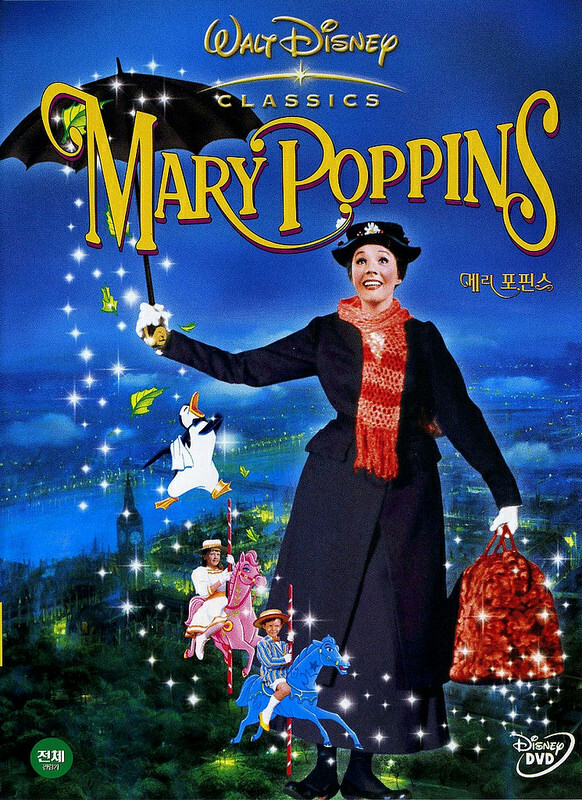 Mary Poppins is definitely a classic film that I’m sure most of us have heard of at some point or another. It’s a light hearted musical/comedy with a punch of supernatural elements to keep things fresh. It’s definitely held up well and can certainly be considered as the definitive musical. I suppose it depends on how literal you take the term since some films are right on the edge of being counted. The film starts off with yet another Nanny running away from her responsibilities. She simply can’t handle the two rebellious kids and their constant running away. The father is forced to run an advertisement for a new nanny. That’s when the Professional Reality Warper, Mary Poppins shows up for her first attack. She summons a tornado to (fatally?) take down the competition and hires herself. Will she be able to make the kids be more responsible or will this be beyond her abilities? The father is definitely the best character in the movie. He sets the tone early on when he bursts through the door at exactly 6:01 and bursts into song. Clearly this is a man of culture and finesse. He isn’t one to be trifled with and commands a very strict home. He reminds his wife that a classic British House is run as tightly as the bank. His song has quite a few great lyrics like that and once the kids return from their brief escapade he is firm but not mean. He comes up with an advertisement in the mail that is quite good. While he may be on the back foot against Mary Poppins, he is always quick to recover. He may have cracked by the end and suddenly become a very happy person but even that role he plays with discipline. He is just the perfect character and certainly the one that I was rooting for. Mary Poppins is an interesting character. Based on the advertisement that the kids left you would assume that she is a very nice person. Well, that actually isn’t the case. She takes everything personally and does seem to hold a grudge. She seems to have a thing against having fun and always has to be goaded into using her abilities. Mary Poppins completely shuts down when anyone asks her a personal question or just anything about her magic and tries to make everyone look bad by denying its existence. It’s hard to get a bead on her and it just seems like she didn’t really want the position at first and only warms up to the kids by the end. Her abilities are definitely as impressive as they ever were though. She has advanced reality warping abilities which are quite handy in any kind of situation. There are also the two kids but they don’t seem to be very good characters. For starters they make the Dad seem like the bad guy but if we’re being honest they deserve most of the blame. Since numerous baby sitters have run off over the years we have to assume that running away is nothing new for them. They don’t have any good reason for running away either and cleaning their rooms is apparently too much to ask. While they get some character development over the course of the movie I just couldn’t find myself being able to like the kids. They even sabotaged their father’s career by making a big scene at the bank and tackling an old man. Any respect I may have gained for the kids before this was certainly lost during this moment. The kids have to learn to control themselves. Even singing their advertisement was not a good move as the only thing it did was really push the father away from accepting it. There is also Mary Poppins friend who knows about her powers. If sounds like they have gone on quite a few adventures so I’m assuming that he follows her around. After all, Mary Poppins seems to travel around quite a bit for each of her cases so I doubt she has been in this town before. Since the guy doesn’t even have a classic job, he probably just gets an occupation at whatever destination she goes too next. He’s a good friend for Mary since she takes everything too seriously while he is the opposite. He may make it harder to cure his uncle from the laughing flu since he is always laughing as well, but that’s his one main weakness. The film’s actual plot is fairly direct and concise so the film does go on some tangents do but time. Fortunately these tangents are actually good do a change. One such scene is with the laughing uncle which I mentioned earlier. I don’t have any sympathy for the Uncle by the way since he can easily stop floating if he really wants too, but it’s fun to see the friend trolling Mary by getting everyone to laugh. Again, the guy is a pretty solid character. There is also a rather long, but fun Looney Tunes esque skit where Mary suckers a few jockeys into letting her win and the characters mess with the animal Olympics. The scenes would probably not be too good if the music was not in point so this is one of those times where the music really amplified the experience. A musical lives or dies on the music after all and these songs hold up very well. The tempo/beat of the music is always very fast and lively which is a good thing. The lyrics aren’t bad either as the characters talk quickly and get a lot of messages in a short amount of time. You’ll just find yourself paying more attention to the musical sounds than the lyrics and that’s not a bad thing. The made up word in the film certainly got popular as well and has enough syllables to be in a song as well. Overall, Mary Poppins is a lot of fun. It’s a film you can enjoy at any time. It’s one of those light hearted films that surprisingly doesn’t get serious or dramatic at the end. It stays whimsical all the way through which is quite rare. It has a lot of replay value and being enjoyable is always the first goal of any film so this one really succeeded. The film doesn’t drag on and the music is on point. If you haven’t seen this film yet then you should definitely correct that. It’s a movie that actually does live up to the hype and that is really rare to be honest. Now I’m ready for that sequel coming up but I have my doubts on if it can be as good as this one. Maybe if she has to fight a dark Mary Poppins in a cool CG fight though. This entry was posted in Live Action Movie Reviews, Live Action Movies, Reviews and tagged Classic, Comedy, Disney, Fantasy, Film Review, Magical, Mary Poppins, Movie Review, Musical, Review, Slice of Life, Walt Disney by dreager1. Bookmark the permalink.